As the first funerals for the victims of the Pittsburgh massacre began, two rabbis and five other volunteers approached the sawhorses cordoning off the Tree of Life synagogue, and an FBI agent led them into the crime scene. Inside the desecrated temple, the men donned white forensic coveralls, face masks and gloves, and set to work. 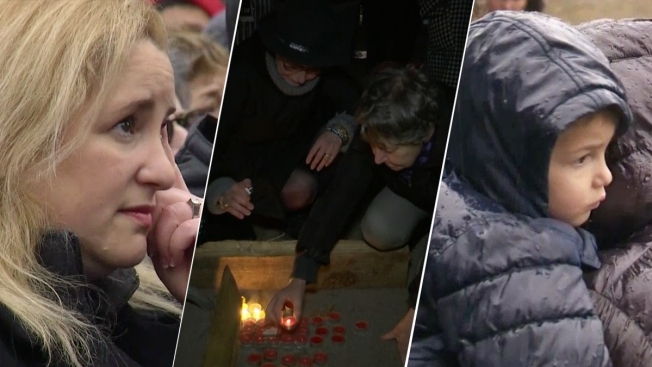 "The Jewish law is that everything that belonged to the body needs to be buried, so we do our best," one of the group's leaders, Rabbi Elisar Admon, said Tuesday. 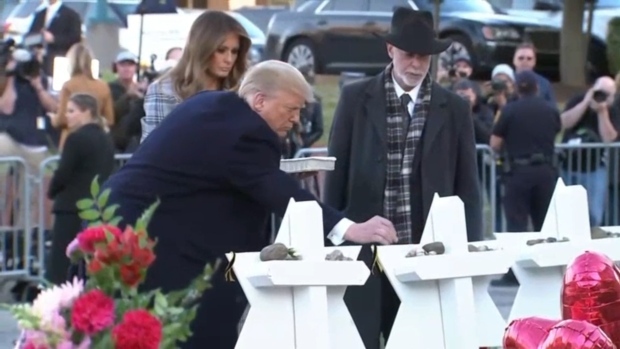 President Donald Trump and first lady Melania Trump visited Pittsburgh on Tuesday as the Jewish community began burying some of the victims of a massacre at Tree of Life Synagogue. But the scale of the violence wreaked by a gunman Saturday has placed an extraordinary responsibility on those dedicated to this work, all volunteers. The victims included one of their own, Jerry Rabinowitz, a doctor who had worked with the group in the past to prepare bodies for burial. Their work began hours after Saturday's attack. Late that night, the FBI allowed Wasserman and Admon inside the synagogue. The men drew themselves a map, showing the precise spot where each of the victims was killed. Then they spent most of the night accompanying the bodies as they were removed to the medical examiner's office. "I'll tell you the truth, Saturday night was very tough. I came home and I just started crying," said Admon, choking back tears. "I've been to a lot of scenes, but these are people you know very well," he said. "It was very hard to see, like, people coming on a Saturday morning to a peaceful place ... to get a connection with God and the same moment they got a connection with God, an evil person came and in and said, 'Guys, just because you're Jewish, I'm going to kill you.'" Most of the funerals will be over before the volunteers can complete their work. That means that the remnants recovered from the synagogue will probably not be placed in the victims' caskets. They will instead be buried separately at the cemetery, with markers listing the names of the dead. For the volunteers, it provides the satisfaction of performing a crucial task. In the end, Jewish law will be fulfilled. But just as important, Admon said, recovering all traces of victims and making them whole will "give these people the respect they need, because it's the minimum we can do."